Traditionally called messenger's boxes, these boxes offer proof of their function as receptacles of books, money, jewels, or other precious items: this sturdy reinforced box has metal hoops for straps to attach to the back of the horse or the shoulder of the messenger. Traditionally called messenger's boxes, these boxes offer proof of their function as receptacles of books, money, jewels, or other precious items: this sturdy reinforced box has metal hoops for straps to attach to the back of the horse or the shoulder of the messenger. The smaller boxes (not this one) may have been worn suspended from a belt. Some of the larger boxes still have remnants of straw or padding meant to protect the shoulder of the messenger or the flanks of the horse in transit. The pious images contained within these strong boxes promised spiritual protection during the journey. They are numerous in their identity, including, the Ecce Homo, Christ Blessing, God in Majesty, the Monogram of Christ's Name, Saint Roch, the Nativity, the Arrest of Christ, and many others. Some boxes (though not this one, apparently) include a double locking system, one lock opening the box itself, and the other lock opening a flat compartment contained in the cover to house the messenger's passport or "right to travel." This curious construction helps explain their use, which accords with laws passed under King Louis XI in 1474 and reenacted in 1483, requiring those "passing by major routes or through border cities" to show to the controller a passport or mandate, or, in the case of messengers of the university, to show at each toll booth and every entrance to a town their "university privilege" so that they could circulate freely. The appearance of the boxes in c. 1485, and their production up through the first decade of the sixteenth century, is explained by the enactment and subsequent relaxing of the law. The recent study prompted by the sale of a significant group of these boxes from the Collection of Marie-Thérèse and André Jammes (Paris, Pierre Bergé, 7 November 2007) included a review of the existing literature on these boxes and made some new observations. Some 21 boxes formed part of the Jammes Collection. Two other substantial collections belong to the Bibliothèque nationale de France (14 boxes) and the Ecole Nationale supérieure des Beaux-Arts (5 boxes). Counting the other messenger's boxes that exist throughout the world in isolated institutional and private collections, the total number of extant boxes comes to approximately 60. There appear to be at least five examples in the United States: the National Gallery of Art (2), the Metropolitan Museum of Art, the Newberry Library, and the Philadelphia Museum of Art. The present box is of the utmost importance. The woodcut, in spite of its condition and the tear that affects the visibility of the head of the Virgin, is the earliest known of all woodcuts from messenger's boxes. Moreover, it can be compared with the production for printers such as Jean Du Pre, Verard and Simon Vostre by the Master of the Petites Heures of Anne de Bretagne, a Parisian illuminator active in the last quarter of the fifteenth century. This illuminator composed designs for woodcuts, metalcuts, and stained glass, as well as for illuminated manuscripts. Most of the woodcuts included in the boxes appear to have been made in Paris, some in the workshop of the illuminator Jean Pichore (active c. 1500-1520 in Paris), who actively supplied models for metalcuts and woodcuts to Parisian printers of Books of Hours. The present woodcut is a traditional rendition of the subject. Schreiber (1150-1155) records several examples. However, the present proof was unknown to Schreiber and is unedited. It is tinted in red, orange, and green wash. The large number of woodcuts these boxes exhibit, some of which exist in very few impressions, constitutes one of the largest resources for the study of fifteenth-century woodcuts during this early period. It invites study of the interaction between manuscript illumination and the production and coloring of prints in the incunable period, the present artist being a prime example of such multi-faceted activity. 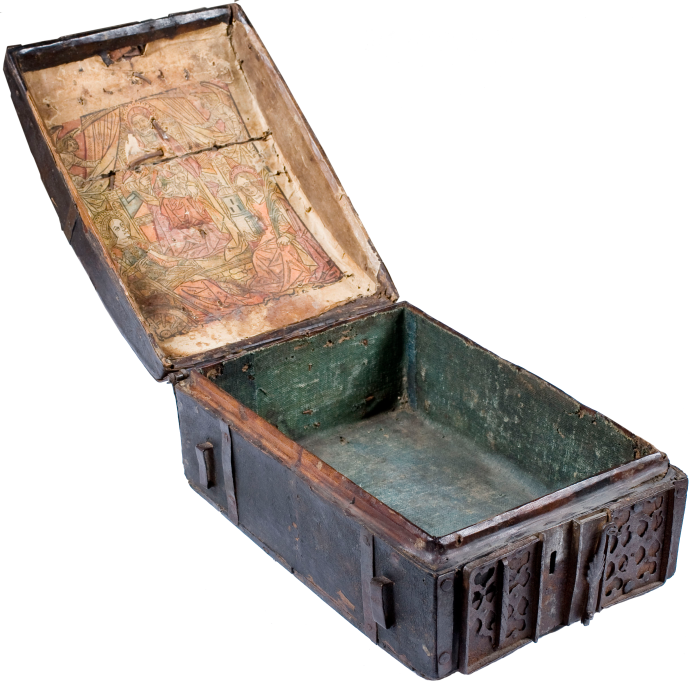 The survival of these boxes, which invites further research, contributes to the intersection between social history, artistic expression, and material culture at the end of the fifteenth century. The box is in good condition, lined on the interior with green canvas, and possesses a simple cover, reinforced by 5 strips of iron. The lock is decorated, and the hasp and its lateral attachments are present. At the origin there was a small cushion under the base of the box. Field, Richard. Fifteenth-Century Woodcuts and Metalcuts from the National Gallery of Art, Washington, 1965. Kup, Karl. "Notes on a Fifteenth-Century Coffret," The Connoisseur, London, 1957. Lemoisne, P.-A., Les xylographes du XIVe et du XVe siècle au cabinet des estampes de la Bibliothèque nationale, Paris and Brussels, 1927, 2 vols.